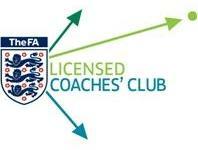 Anyone can attend this FALCC event, but only Level 1 and 2 coaches will gain CPD Hours for their FALCC Membership. These FALCC hours will count towards the 2018-19 season only (1st August 2018 - 31st June 2019). - Classroom workshop & practical observation. - The session will also incorporate England DNA: How we coach, how we play, who we are, how we support & the future England player. Suitable clothing/footwear for classroom session and outside observation on 3G.